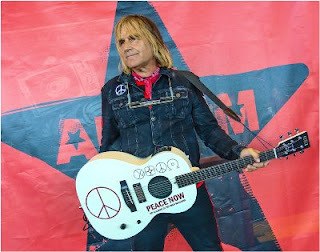 To celebrate this year’s Record Store Day (April 21), the Alarm‘s Mike Peters will undertake a massive feat: a three-stop transcontinental trip within 24 hours, hitting record stores in London, New York and Los Angeles. For RSD, the band will issue a limited edition eight-song EP Where the Two Rivers Meet. It’s the latest release from the Welsh band who’ve had 17 Top 50 UK with over five million in album sales worldwide in their 35+ year career. This is an official exclusive release for World Record Store Day 2018. “I’m so proud of the new music that is being made in the name of The Alarm right here and now,” says singer, songwriter and guitarist Mike Peters. Born out of the intense Blood Red Viral Black sessions (2017), the new release stands alongside some of the best work to carry the hallmark of The Alarm. It is a vital piece of music, that features an electric contribution from Billy Duffy of The Cult and songs that will only be available in this limited edition format for #RSD18. Throughout the day on April 21, the band is asking all Alarm fans to take a picture wearing their favorite Alarm t-shirt sharing the photo on social media using the #RSD18thealarm and #RSD18 hashtags. Those who share their photos online (and using the appropriate hashtags) will automatically be entered into an online Alarm lottery that will entitle the winner to a unique and special 7″ vinyl single that will recorded and pressed by Peters at the beginning of the day. The winning entry will be announced by Peters following his final appearance of the day.